Info Cube is structured as Star Schema (extended) where a fact table is surrounded by different dim table that are linked with DIM'ids. And the data wise, you will have aggregated data in the cubes. Infocube contains maximum 16(3 are sap defines and 13 are customer defined) dimensions and minimum 4(3 Sap defined and 1 customer defined) dimensions with maximum 233 key figures and 248 characteristic. There are two subtypes of InfoCubes: Standard, and Real-Time. Although both have an extended star schema design, Real-Time InfoCubes (previously called Transactional InfoCubes) are optimized for direct update, and do not need to use the ETL process. Real-Time InfoCubes are almost exclusively used in the BI Integrated Planning tool set. 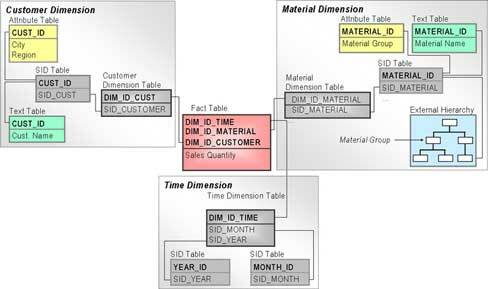 All BI InfoCubes consists of a quantity of relational tables arranged together in a star schema. A BEx query can only be written against a single InfoProvider. A MultiProvider is a single InfoProvider to a query but through it, multiple providers can be indirectly accessed. Excellent blog Thanks for sharing a good information, This Article is useful to learners.